Will the Red Bus driver stop for the sign? Our observation says, 90% of the time, he or she won't. Bounced around during a stressful ride on a RIOC Red Bus, I decided, once my feet were again on solid ground, to find the extent to which RIOC's drivers observe the ordinary rules of the road. Paying attention to stop signs seemed a solid, basic standard by which to judge. The amount of risky behavior I saw surprised even a cynic like me. Years of experience on the road taught me that drivers, whether it's in town or on the Thruway, will usually do whatever they feel like as long as they believe they can get away with it. In a small town like ours with a lot of foot traffic, plenty of parks and playgrounds, safe driving is a serious matter. Pedestrians and children at play are likely to take for granted that stop signs will be honored, especially by those in the government's employ. Red Bus drivers should be setting an example, but watching for a few weeks showed that the opposite is true. Here's a video from inside a Red Bus as the driver cruises past a stop sign with barely a pause. The sign was put there, where there's no crosswalk, apparently because it's on the border of a playing field heavily used by kids as well as adult athletes. By my count, Red Bus drivers ignore it 9 out of 10 times. It's not an isolated incident. I stayed on this bus until we arrived at the subway - after running five more stop signs along the way. This behavior is so common, it's hard to escape a conclusion that drivers are confident that their fellow RIOC employees at Public Safety are not going to enforce anything. When I wanted to get a video, I never had to wait for a next bus. Every driver obligingly ran the stop sign, as expected. Once, I counted six Red Buses passing before the first stopped. I also looked to see what other drivers were doing. MTA buses, shuttles, passenger cars - all stopped before continuing. That's not always the case. Anyone who walks Roosevelt Island has opportunities to dodge cars coasting through crosswalks. It's just vastly more common with Red Bus drivers who reliably stop at crosswalks, but not at stop signs. The driver in our next video at least takes his foot off the gas briefly, even if it's not to press it on a brake pedal, but it may as likely be to negotiate the curve as to salute the stop sign. Shown the videos, RIOC management took a strong position in favor of the legitimate rules of the road with no excuses. 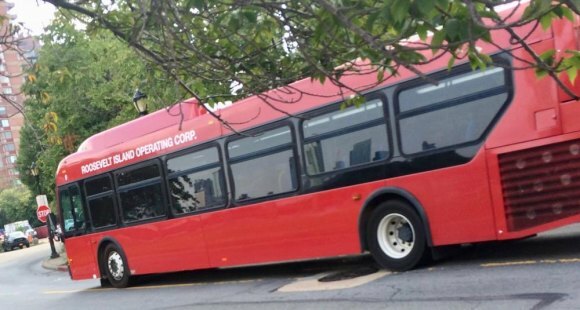 "Following all traffic laws and stops is, and should be, the most important job of all our Red Bus drivers and other employees driving RIOC vehicles across the Island," wrote Public Information Officer Alonza Robertson in an email. "We intend to further review your videos, issue warnings and reminders."